Standard - €95.99 Only 6 left! If you go deep into the scary fairytale forest, you may come across a house made of candy. As sweet as that house looks, do not take a bite out of it because then you'll awaken the most evil of all witches. This horrible witch captures lost children who nibble on her home and cooks them up for her nightly dinner. If you’re easily scared, then perhaps a dark, scary forest isn’t a place you should be lingering in. But if you’re not into the highly terrifying, then maybe you can turn scary on its head by getting in on the action. A scary witch costume could be just what you need to turn heads this Halloween while simultaneously getting rid of your own fear of witches. It’s a win-win situation! Give all the neighborhood kids the frights when you wear this scary witch costume. Don't be shocked if they are a little too scared to take candy from you! This adult witch costume starts with a brown burlap robe that is fully lined for a warm, comfortable look. 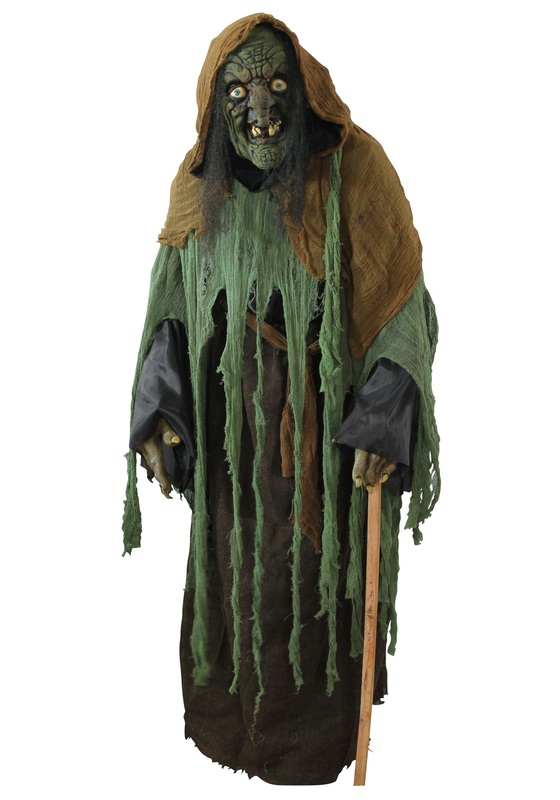 Green and tan cheesecloth drapes add a much-needed scary element to the robe and you can drape them however you wish to give yourself a unique look for Halloween. Top off this scary witch look with the green latex witch mask that has attached black hair for the ultimate in scary this Halloween.